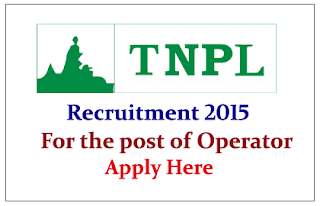 Tamil Nadu Newsprint and Papers Limited is Hiring for the post of operator for Water Treatment Plant / Effluent Treatment Plant 2015. Eligible candidate can apply here on or before 21st May 2015. Class Diploma Chemical Engineering / Chemical Technology. Eligible Candidates can apply on or before 21 / 05 / 2015, for more details check official Notification.